Remember way back when I had the Mystery Quilt Giveaway going? Was that really nearly a year ago? Well, this quilt has been in the works for much longer than that. I first dreamt it up after our school’s spring auction in 2009. I had contributed this quilt for that auction, and started thinking about what kind of quilt I could make for the next auction. I think it was about that time that the students voted for the school mascot to be a Firebird, and the art teacher drew up a beautiful little firebird line drawing. That’s when it hit me that a mascot quilt would be perfect for the auction. But, I have to tell you, this quilt has been nothing but trouble from the start. 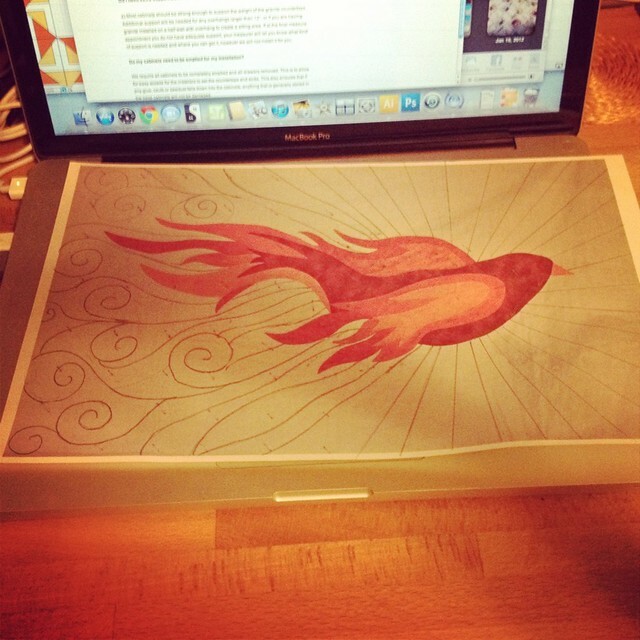 It was a year before I enlarged the original sketch onto an enormous sheet of butcher paper. And did I mention that I was about 7 months pregnant at the time? So there’s an image for you. Giant pregnant lady crawling around on the floor sketching on a giant piece of paper that insisted on rolling up. After the pattern was made, I sat on the project again for a long while trying to decide what fabrics to use. I knew I would use (obviously) fire colors, but no matter what fabric stacks I pulled I didn’t like anything. I can’t remember what I was working on when I realized that these “almost” solid cottons would be perfect for this project. Just enough movement. The actual applique wasn’t bad at all, and it came together fairly fast. I was really excited at how well it was going so I was ready to get it quilted when I discovered I had no thread that I thought would work. 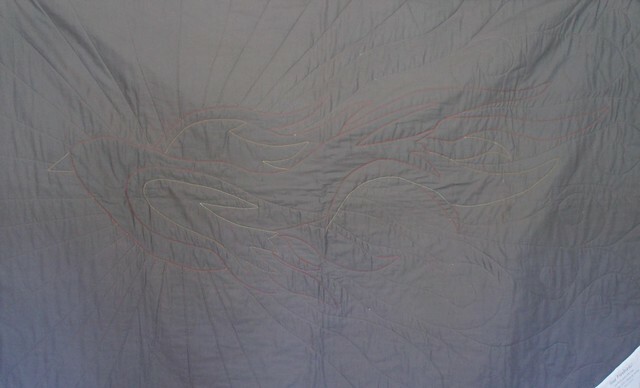 Back then I did all most of my quilting by hand and I planned to do the same on the Firebird. 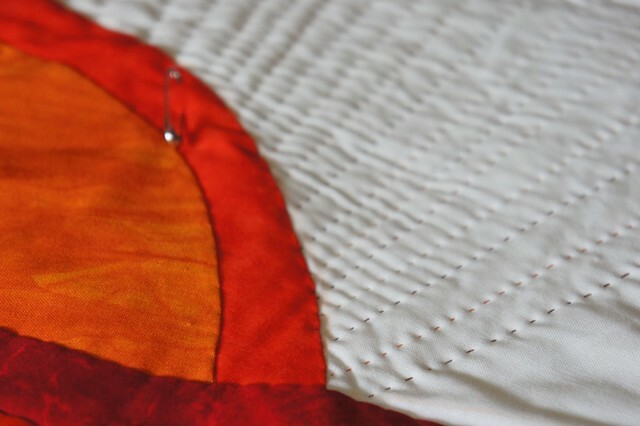 After searching at multiple stores for a variegated hand quilting thread in firey colors, I finally settled in and started stitching the starburst pattern. Some of you may have seen me sitting in the sewing room at Sewing Summit stitching a thousand straight lines on this quilt. I was about halfway through by the end of the Summit. 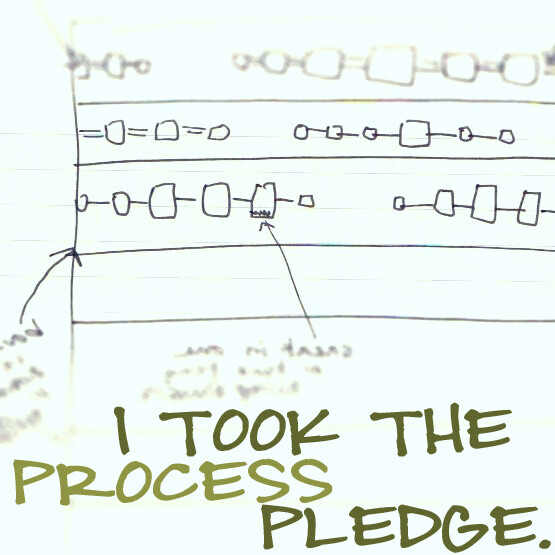 That’s when I decided I hated the quilting. I mean really really hated it. So I put the quilt down and walked away. For about 6 months. 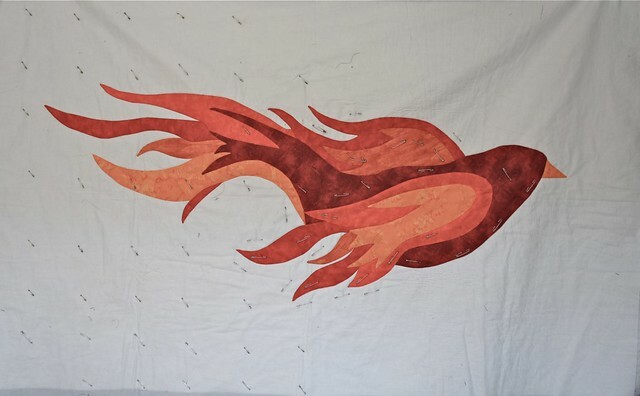 When I picked her back up, I realized that part of what I hated was the fact that the quilting was causing the bird itself to bunch up in the middle of the quilt. I decided that it must be picked out. Really, it didn’t take that long. Pretty much a snip at the starting end and a yank on the other end and out came each thread. I was still sad looking at that pile of used threads. It just seemed like so much work wasted. And by now I was running out of time to get the quilting done in time for this spring’s auction. I decided I would machine quilt it starting with stitching in the ditch around the bird to anchor it down this time. I had this quilting pattern in my mind from the very beginning, and so when I finally decided to draw it on paper I was really glad to see that it looked as good in the real world as it did in my head. Now I was super excited to get the quilting done. So I fired up my machine with it’s new walking foot and started stitching. It wasn’t long before I realized that using white thread on both the upper thread and the bobbin was a mistake. The back of the quilt is Kona coal, and that white thread just looked awful. But by now I was feeling really pressed for time. I was exploring options to actually color the thread on the back with a marker or pencil or something… I wouldn’t recommend that approach. Both the sharpie I tested and the pencil showed through on the white front. Ok, so the only option was to once again pick out the quilting and start over. And once again, it took a lot less time than I anticipated. It also got me thinking about thread tension because the lower thread tension was way too loose and the threads slid right out. Well, third time must be the charm because I finally finished the quilting. This time with a dark gray in the bobbin and the tension adjusted properly. 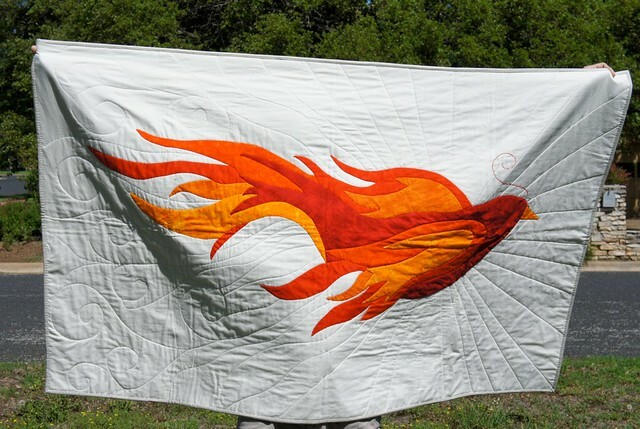 The firebird’s quilting was done in various shades of red, orange and yellow, and it shows on the back. I think I like it, but I’m not sure. I love the gray though. After making the label for Alexis’ quilt, I think I might be addicted to the freezer paper + printer method. Because this quilt shouldn’t need to be washed often, I just used the printed label and didn’t add any hand quilting. The binding presented another challenge. 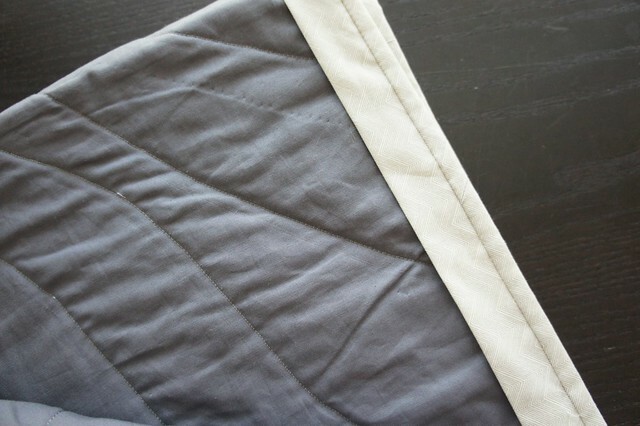 I had originally planned to use a very pale solid gray, but after the way that turned out on this quilt, I thought that might just be too blah. I considered using one of the fabrics from the bird, but thought that might detract from the bird itself. I considered using the Kona coal, but decided that would be too much of a frame. By chance I had ordered some Sally’s Skirt from the Sweetwater Reunion line, but in cherry and ink (that’s red and black to the non fabric geeks). That tiny herringbone just speaks to me. The graphite color way was the perfect shade of pale gray. 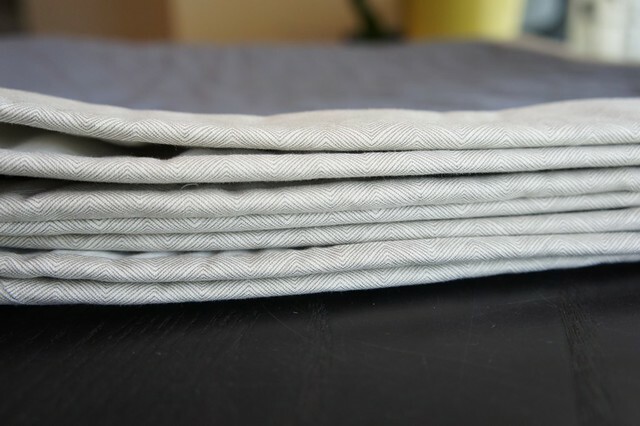 I love the binding on this quilt. Love. It. I also added a dowel sleeve for hanging using Rachel’s tutorial. 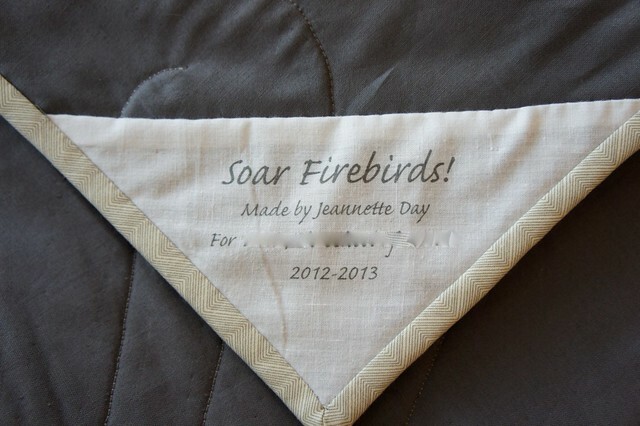 As it turns out, the school wants to save the quilt for next year’s auction (hence the future date on the label). Which was fine by me, because when they called to tell me, I was still agonizing over the binding. I debated putting the whole thing away for a while, but then decided to get it off my to do pile once I found the binding fabric. 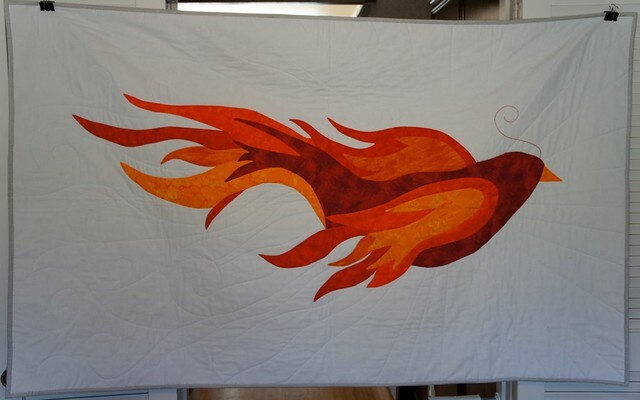 So, 3 years and 2 froggings later, the firebird is done. I couldn’t be happier with it. Outstanding! Sometimes the ones that give us the most grief are the ones most beautiful in the long run. Gorgeous, lovely work, take a bug pat on the back from me. tee hee – no, I’m not going all praying mantis on you – make that a BIG pat on the back! AMAZING! Your skills really blow me away. You make the most beautiful quilts. And this one is up there with one of my favorites. Saw this on quilt story and had to tell you that the quilt is absolutely beautiful. Well done! OMG that is incredible!! 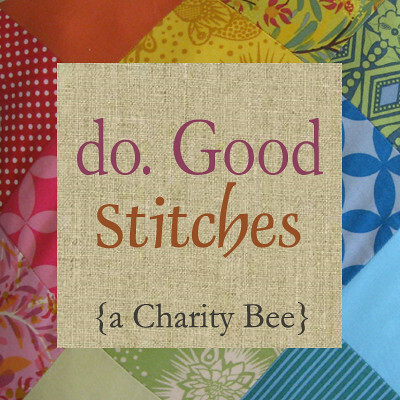 It caught my eye when I saw the thumbnail over at Quilt story-Fabric Tuesday! Stunning!! The swirly quilting looks so effective! I just popped over from the sewing summit google groups. I’m in love with that quilt. It’s really cool. I’m so excited to be going to the sewing summit and getting to know everyone. I hope your having a fabulous day.